“Florida prison board reverses decision to ban newspaper over hunger strike coverage,” the Reporters Committee for Freedom of the Press headlined an article on its website Oct. 16. The story reported on the victory won by the Militant when Florida state prison officials informed the paper it overturned its Sept. 5 decision to bar the paper’s July 22 issue that reported on 30,000 California prisoners launching a hunger strike in July. The Militant’s victory is part of the broader fight against censorship. A victory over book banning was won Sept. 25 when the Randolph County, N.C., school board was forced by a public outcry to rescind a nine-day-old ban on Ralph Ellison’s Invisible Man from school libraries. The paper has been contacted by two more workers behind bars who had issues of the Militant reporting on the hunger strike confiscated or rejected, one in Washington state and another in a different Florida prison. The San Francisco Bay View, an African-American newspaper that reports widely on prisoner issues, also released a statement in support of the Militant’s fight, as did a number of activists who have joined protests in California to back the hunger strikers’ protest against solitary confinement. The number of workers thrown into prisons and jails has exploded. Government statistics show some 2.3 million incarcerated in the U.S. — a jump of 274 percent over the last 25 years. The plea-bargain system has largely replaced trial by a jury of your peers. Some 95 percent of those behind bars were pressured into copping a plea under threat of more draconian sentences. Prison Legal News began as a 10-page hand-typed newsletter for 75 subscribers produced by two inmates in different Washington state prisons, Paul Wright and Ed Mead. Wright, who remains the editor, served 25 years on trumped-up charges of murder. He won parole in 2003. 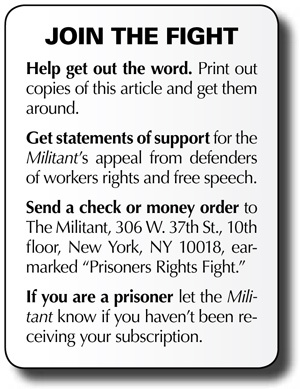 The newsletter now has 7,000 subscribers, overwhelmingly inmates, and estimates that it gets into the hands of more than 10 times that number from being handed around from inmate to inmate, much like the Militant. Prison Legal News has faced censorship beginning with its first issue. It currently faces a blanket ban in 10 state prison systems. The newsletter had been banned in South Carolina when that state barred all publications from inmates other than the bible. Jails in Sacramento County, Calif., barred it, saying the staples it was bound with were potential weapons. Wright also says that Prison Legal News has to take on the fight against censorship itself, because the big-business press won’t do it. “They tell us they are not part of their targeted advertising demographic,” Wright said. Material censored around the country varies. Texas maintains a list of some 12,000 books that are banned. An increasing number of jails bar everything except postcards. Other institutions target political news and reports of protests of prisoners against solitary confinement and other abuses, like the impoundment of the Militant in Florida and Washington.